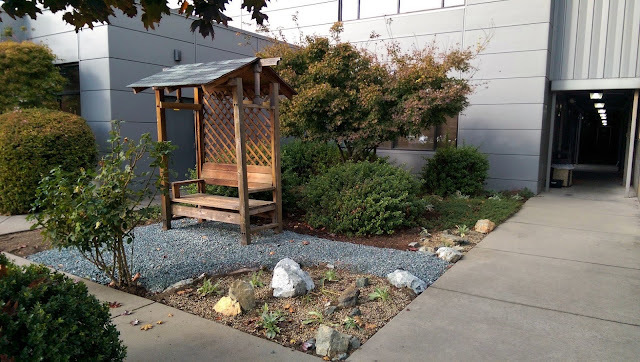 Earlier in the year some of you may recall when I mentioned I was doing some landscaping at my work, a large cabinet manufacturer in Grants Pass. I had gone to the General Manager (remember, it is a plant with 800+ employees and two shifts) and suggested that I could fix the horrible mess outside. What I was referring to was the vast expanses of bare compacted clay around some boring and apparently struggling landscaping plants. Particularly in front of the main office where all the corporate exec's enter when they come to audit the plant, there were large areas of rock-hard clay which had been used as a walkway (employees had been walking through these areas for at least a decade). I had a plan, and the GM was willing to pay me to execute it. This is the oldest photo I have of one of the sites. I brought the rocks in and the company paid for the gravel. The gravel has two purposes: first to serve as a walkway and landing pad for an existing bench, second reason is to hide a large slab of concrete that was the cap to the old well which has been out of use for decades. A third reason, more of a bonus, is that it brings the area up to grade with the cement sidewalk. In Winter this area has historically turned into a mud pit as the compacted clay softens and sticks to shoes like glue. For some reason, people still walked through it. I took this photo as an example of the existing landscaping. Most everywhere is strewn with patchy sections of Arctostaphylos uva-ursi and filled in with a variety of boring shrubs like Nandina, Euonymus, and Escalonia with a few trees (mostly Prunus hybrids and a few Acers). Bare patches are everywhere. Part due to the poor growing conditions (much of the landscaping is in the parking lot) and the fact that much of it is walked on. This is another reason I created the gravel path, I don't want to fight the nature of people. A few years ago, before I started this project, the Excalonias here were vastly overgrown and also partly dead from an exceptionally cold Winter we had experienced. Before they died back, they had grown over the Arctostaphylos, killing it in spots. At my request, a landscaping crew was paid to cut the beasts back. The results are seen here, boring mounds of green with a lot of death inbetween. I planted some Stachys byzantina and Hemerocallis here to see if they would fill it in. Time will tell. Also planted here is hundreds of Crocuses of different species, mostly sieberi and chrysanthus. This is another corner that was completely devoid of life. Being a dry hot site that receives the full baking afternoon sun in Summer (and the radiant heat from the metal walls of the facility) I decided it would be best planted with some really tough plants. 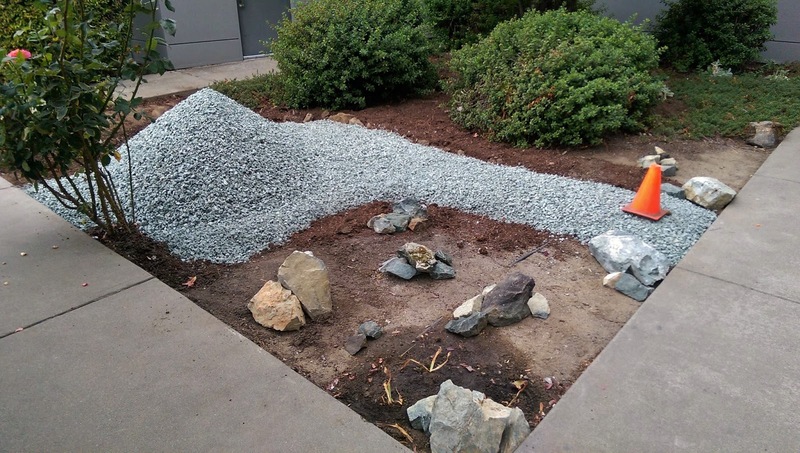 Rocks are used strategically to persuade corner-cutters from walking over the planting, as well as adding a rock garden feel to it. The spot is planted with hundreds of Crocus, Sedum album, Sempervivum, Stachys byzantina, and Kniphofia (which I grew from seed). There are also a few Alliums in the back with the Stachys. My dream is to incorporate some natives into the planting. This Iris grew spontaneously in a seed pot at my house. Being a native it is one of the toughest plants in the entire planting scheme so if an obvious choice for this site. I'm also growing a native Monardella to plant here sometime next year (and a few other surprises). Stachys byzantina is an easy plant, very forgiving. If it is happy, it will produce the purple fuzzy flower spikes. If not, it adds a nice contrast to the existing plants. Returning to the side with the gravel path, this is the corner planting. The existing substrate was the compacted clay, which I tilled by hand with a pickax, before bringing in sand to top it. I then planted Stachys byzantina, Allium cernuum, Iris germanica, Sedum album, and a seed grown Agapanthus. Of course, there are also a ton of Crocuses here too. This large stone broke in half in my struggle to acquire it from an abandoned quarry near my house. The split has given me the opportunity to plant some Crocuses and Sedum within it. Should be interesting. Prunella vulgaris, an Oregon native, is happy here under a dwarf Acer. Given the right conditions and it will flower continuously from Spring to Autumn. It will also spread out. A good, easy, and highly underused landscaping plant. In a shaded area under a dwarf Acer I brought in a few mossy rocks. The moss is interesting and adds something special to the planting. The use of aged rock has a lot of advantages, and makes it look like thought was put into the project. People like this kind of stuff, it adds a covert level of interest for those willing to look for it. Sweet violets are another easy plant that lends itself well to this planting. They will seed around and spread, eventually forming a carpet of blue, white, or pink flowers in Spring (and a few in Autumn). Abelia is one of the existing plantings that I actually agree with. It is planted on both sides of the main office entrance and kept tidy. The flowers appear over a long period and are attractive to honeybees, whom I see visiting it often. A few views of this (nearly) complete landscape. 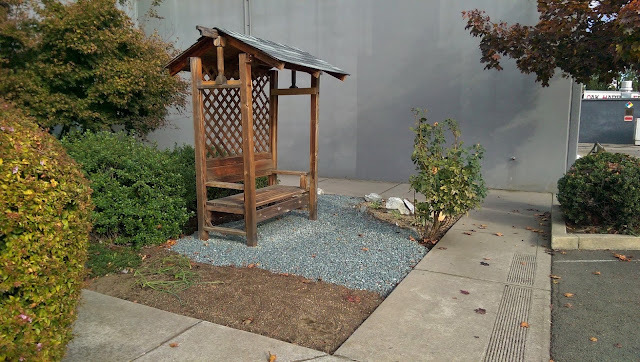 The sand patch to the left of the bench will be planted with something in the near future, and the poorly located rose leaning over the sidewalk has since been removed. It's going to be nice, and is a huge improvement over what it used to be. I will show off these plantings again in Spring when the Crocuses bloom. Stay tuned! I can't wait to see it when it blooms. You can tell a lot of time and energy went into your work ! Thanks for sharing it. Such a thoughtful improvement, with a lot of foresight for longevity and hardiness. Look forward to seeing it fill out, and yes, bloom!